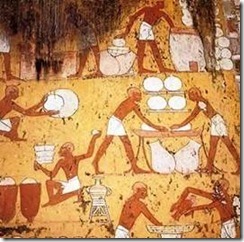 Doubtless, ancient Egypt’s probably eat better than many others in the ancient world. 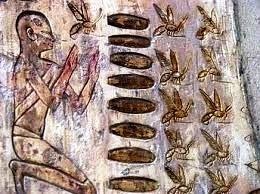 Ancient Egypt refers to its rich, dark, fertile soil and we have no doubt that since the invention of agriculture, Egyptians, with the Nile Valley and Delta had a distinct advantage over many others when it came to food. 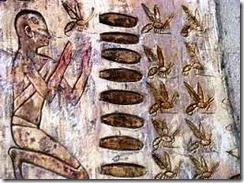 Of course, there were lean times, when the inundation of the Nile failed them, but most often, this was not the case. 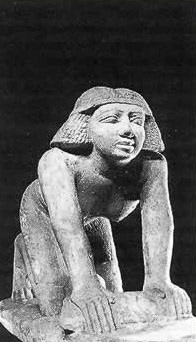 In fact, we find many statues and pictures of ancient Egyptians who are well overweight. 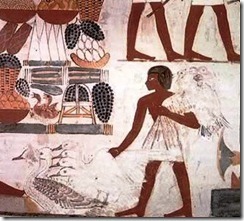 Agriculture existed from an early date in Egypt. For the common people of Egypt, cereal foods formed the main backbone of their diet from the pre-dynastic period onward even for the rich; this staple mean generally consisted of a variety of different breads, often with other ingredients mixed in. Sometimes these ingredients were purposeful, while at other times not. Because of the crude utensils used to make bread, quartz, feldspar, mica, Ferro magnesium minerals and other foreign bodies, including germs were almost always present in the flour. bread was made by mixing the dough, kneading it with both hands or sometimes with the feet in large containers. Yeast, salt, spices, milk and sometimes butter and eggs were then added, before the bread was placed in a baking form or patted into various shapes. Sometimes thick loaves were made, with a hollow centre that was then filled with beans, vegetables or other items. Sometimes flat bread was made with raised edges in order to hold eggs, or other fillings. Eventually, bread was made with various other ingredients, but there was no distinction between bread and pastries. Yet bread was often sweetened with honey or dates, or flavoured with sesame, aniseed or fruit. 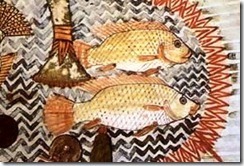 Obviously, even for the poor, other items such as vegetables, fruit and fish were consumed, all gifts of the Nile. 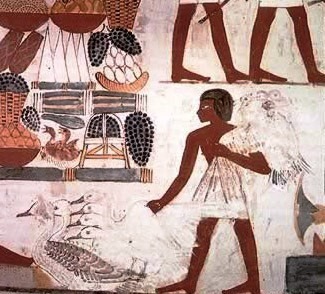 They often ate beans, chick peas, lentils and green peas, just as modern Egyptians do today. Leeks and Egyptian lettuce was also popular. Garlic was eaten, as well as thought to repel agents of diseases, and onions were popular, as well as being used for medical purposes. Though Herodotus tells us otherwise, radishes do not appear to have been consumed much. We know that figs were eaten, but mostly from illustrations and references. Grapes were popular when available, and were also sun-dried to make raisins. Persea Mimusops laurifolia we know from the food left in tombs, as well as pomegranates, which have been found as far back as the12th Dynasty. We have even found a watermelon in the New Kingdom tomb of Nebseni. We only know of Egyptian plums from the New Kingdom, and the peach does not show up until the Ptolemaic (Greek) period. Olives were probably bought into Egypt with the Hyksos in the Second Intermediate Period, but walnuts and carob pods (St. John’s bread) are only known from the New Kingdom onward. 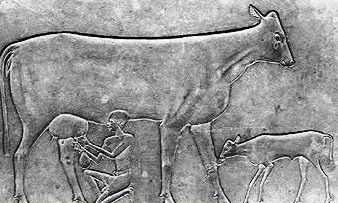 While milk, cheese and butter are not well attested to, at least in text, we certainly believe that the early Egyptians were familiar with all of these dairy products. 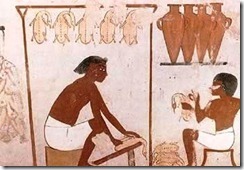 We do find a number of scenes showing men carrying what appears to be pots of milk or cream, and in one Theban tomb from the19th dynasty, we find a seated woman pulling white cones of what is probably butter or cheese out of a large vessel. Common people used various fruits as sweeteners, though the most popular seems to have been dates. Without doubt, because of Egypt’s rich soil and lush vegetation, the rich of Egypt probably always ate well, even during times of drought. In the worst of times, common people probably suffered to some extent, but mostly they were probably fed well, though not as lavishly as the rich. Common bakeries were not known until the New Kingdom, but larger kitchens were manned for work gangs, the military as well as the royal household and temple personnel. 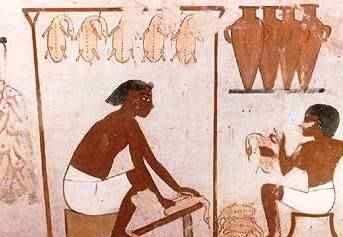 Common meals were often served with beer, or for the very rich, wine. Beer was fermented mostly from wheat, though occasionally stale bread was utilized. 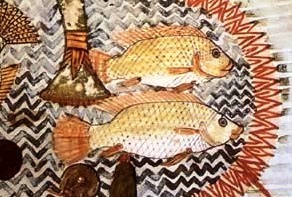 Notation: While one may discover “ancient Egyptian recipes” on the internet, text for recipes on cooking food are notoriously absent from the archaeological record.